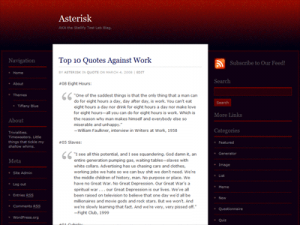 Rubidious is a three-column theme sporting deep hues of red and blue. The theme name is based on the chemical element Rubidium, which comes from the Latin term for “deepest red”. Two light-on-dark sidebars sit on opposite sides of the main content. The left sidebar is called “menu” in the Widgets configuration page (WordPress 2.5), and is ideally made for navigational elements like links various subpages. The theme supports WordPress 2.5’s avatar features, though it should work with WordPress 2.3 just fine. Update: Rubidious has been updated for compatibility with WordPress 2.7 and up. Download the latest version here. I was wondering it it supports wp 2.8x? I’m using 2.8.4 and looks like i can’t activate it, i get error like permission denied or something like that. Really like your theme by the way!